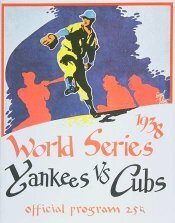 The 1938 World Series matched the two-time defending champion New York Yankees against the Chicago Cubs, with the Yankees sweeping the Series in four games for their seventh championship and record third straight (they would win four in a row this time, and five in a row later from 1949–53). Dizzy Dean, who had helped carry the Cubs to the National League pennant despite a sore arm, ran out of gas in the Series as the Yanks crushed the Cubs again, as they had in 1932. The Cubs did not win a meaningful game against the Yankees until a regular-season interleague series in 2003. Yankee starting pitcher Red Ruffing won two games without a loss, although he gave up a record seventeen hits in eighteen innings pitched. This was the first World Series at Wrigley Field since the bleacher reconstruction of 1937 which had significantly shortened the left-center field power alley. After a six-year hiatus, the Chicago Cubs managed to top the National League, despite making it there by the slimmest of margins. After a ninth-inning, 6-5 win over the Pittsburgh Pirates (who had led the National League for 2½ months) on September 28th, the Cubs managed to hold onto first place while winning the pennant by a mere two games. Rip Collins led the team in homers with thirteen, and outfielder Augie Galan topped the Cubs in runs batted in with sixty-nine. Stan Hack batted .320 and led the National League with sixteen stolen bases, and Carl Reynolds hit .302. Bill Lee and Clay Bryant were the staff pitching aces with twenty-two and nineteen victories. Dizzy Dean, who tried to come back too soon after his All-Star Game toe injury of 1937 and hurt his arm, had been obtained from the St. Louis Cardinals in April and won 7-of-8 decisions. Their opponents, the 2x-defending champion Yankees were still dominating things on the American League side. 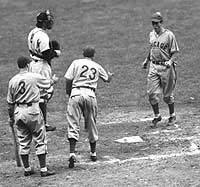 This time five New Yorkers compiled RBI totals over ninety, and those five; Joe DiMaggio, Bill Dickey, Lou Gehrig, rookie Joe Gordon and Tommy Henrich had home run totals ranging from thirty-two to twenty-two. Red Ruffing led the American League in victories with twenty-one, followed in the rotation by Lefty Gomez (eighteen wins), Monte Pearson (sixteen wins) and Spud Chandler (fourteen wins). The result was a 9½ game lead over the Boston Red Sox for the American League pennant. Bill Lee got the call for the Cubs in the Series opener and while the big right-hander pitched well, he did not pitch well enough to win. Bill Dickey went four-for-four against him; scoring a run and driving home another as the Yankees pulled ahead with a "predictable" 3-1 triumph. Nothing changed for Game 2 although the Cubs' Dizzy Dean appeared in control almost till the end. He contained the Yankees for seven innings at Wrigley Field and had given up only three hits while leading the contest, 3-2. George Selkirk added the Yankees' fourth hit as the leadoff man in the eighth, but two force-outs left Dean in a position to escape with one more out. Frankie Crosetti (who was on the bottom of the Yank's home-run list with nine) stepped up with Myril Hoag leading off of first base. Swinging at the first pitch, the unlikely hero sent a shockwave through the stands with a bomb over the left-field wall. Dean and his teammates stood in disbelief and were unable to answer the call in the ninth as the Yankees held on for the 6-3 victory. Ahead two-games-to-none with the Series shifting to Yankee Stadium, the New Yorkers seemed to be a lock. Game 3 and 4 were quick (and painful) as the home team's momentum carried them to 5-2 and 8-3 finales that featured solid hitting by Crosetti who added a double, triple and four runs batted in to his stats. On a somber note, the ailing Lou Gehrig, went four-for-fourteen (all singles) for his last Series appearance. The Yankees had completed their fourth Series sweep in their last six appearances and became the first team to win the World Series in three consecutive years. The American Leaguers appeared unstoppable and most felt that the Cubs never had a chance.